In general, Thai rice noodles are called sen lek, or small strand. Prepping the noodles can be done a variety of ways, depending on your use. For quick and easy noodles, soak in boiling water before using for 7-10 minutes or until soft, but still somewhat firm. Make sure the noodles are covered in water. However, if you are making pad Thai, soak the noodles in lukewarm water instead. The noodles should be somewhat soft. It is better to under-soak the noodles if you are planning on cooking them or pouring hot soup on top. If they become over-soaked, but not yet falling apart, drain the water and let the noodles sit for a while to dry out. 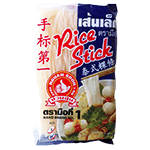 For the perfect Pad Thai, try these rice stick noodles with our popular Maesri brand Pad Thai Sauce. Product of Thailand.